Sold as recently as May 2018, the 50 metre motor yacht Mosaique is back on the market, listed for sale by Peter Bennett at Bluewater. Designed by Dubois,Mosaique was built in steel and aluminium by Turkish yard Turquoise Yachts to ABS class and MCA coded with delivery in 2002 and a refit in 2015. Her relaxing interior by Kristina Ferrand has a country house style decorated in mahogany panelling with satinwood banding accommodating up to 12 guests in six cabins. These comprise a master suite and VIP suite on the main deck, while on the lower deck are three doubles and a twin, all with entertainment centres, flatscreen televisions and en-suite bathroom facilities. 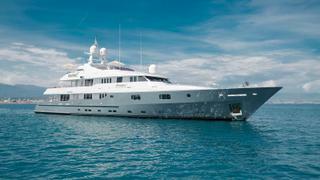 In addition, there are quarters for 12 crewmembers aboard this yacht for sale. The main deck saloon has comfortable seating, a bar and an entertainment centre including a 50-inch Pioneer television screen and is linked to a games room, which in turn leads through sliding glass doors to the formal dining room with seating for up to 12 guests. On deck, a favourite spot is her sundeck with a Jacuzzi surrounded by sunpads and loungers, a bar and two tables for informal, al fresco meals. Another outdoor dining area is located on the upper deck with seating for up to 16 guests around an oval teak table sheltered by the sundeck above. Her 84,700 litre fuel tanks and twin 1,100hp Caterpillar engines translate into a range of 4,500 nautical miles at 14 knots. Lying in Tarragona, Spain, Mosaique is asking €10,950,000.